This post is sponsored by Nuffnang and Arnott’s. Since the start of 2012 I have been attempting to reduce my carb in take. I don’t think I will ever be a complete no-carb eater. I exercise a lot, love long distance running and advice from a sports nutritionist last year and recent research highlights that for me, carbs do need to form part of my diet. But my carb in take has been too high, hence reduced consumption being one of my goals again for this year. To work on lowering my carbs, I have been by making small changes to our family meals. I have planned less meals with rice or pasta as an accompaniment and when included on the menu plan, I am serving myself smaller portions. This has been working well. 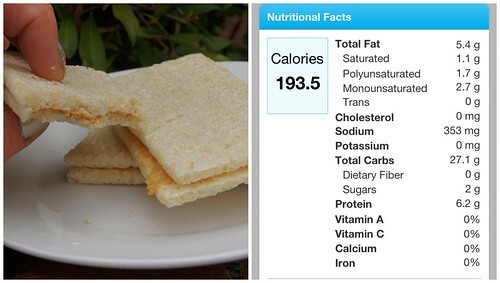 82.9 grams if carbs – quite a lot! I had been thinking of ways to change my lunch time habits, but put it off with various excuses. I am one who doesn’t shy away from a challenge though, so when asked to swap my toast for Cruskits for a week, I saw this as a great opportunity to make another small change to my diet. Two Cruskits have 60% less carbs than two slices of most bread, so should make a difference to my carb in take across the week. Cruskits have been a regular on our shopping list since we had kids. As babies when they started on solids, I would use Cruskits instead of rusks and the kids loved them. They still love them and will often have them as a snack or for lunch – I needed to be following their example! The Cruskits swap was the only change I made to what I ate for the week. I still had the same breakfasts, morning teas, afternoon teas and evening meals. My exercise routine for the week was also consistent with previous weeks. And as is usual with my weekly eating, there was chocolate and diet coke consumed! For the first day, I thought I would make a small change to my lunch, with just a substitution of bread for Cruskits, keeping the peanut butter. 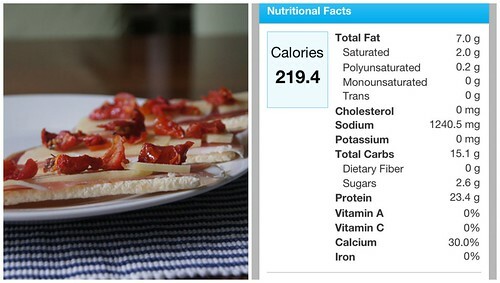 I used some left over food items in the fridge for lunch on day two, prosciutto, cheese and semi sun dried tomatoes, way more fancier than peanut butter. It tasted delicious and it was filling. After lunch I noticed I didn’t feel so bloated, didn’t feel like my tummy was trying to escape over the top of shorts! 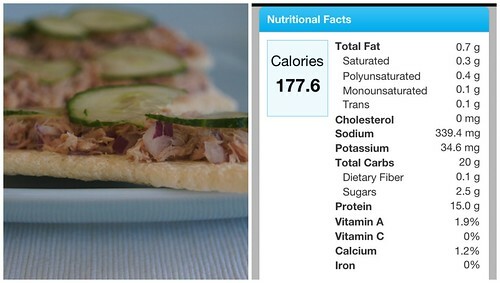 So far so good and for day three I combined tuna with spanish onion and lemon as the main part of the topping. The combination was a nice light flavour and as it was a lovely day, I sat outside and ate lunch in the sun. I was going to have lunch at a friend’s house, so wanted to take along something to share. 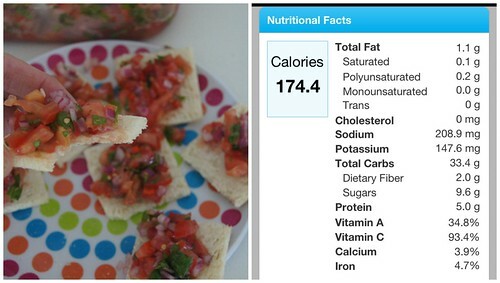 I opted for some homemade salsa to have on the Cruskits and chocolate balls for a sweet treat afterwards. In terms of flavour this topping was by far my favourite! I had asked on my facebook page for suggestions of toppings on Cruskits and had many wonderful suggestions, one of which was Mexican Dip which gave me inspiration for this topping. However by 3pm I was really hungry. There wasn’t really enough in the topping (notable in the reduced protein content) to keep me going until afternoon tea. 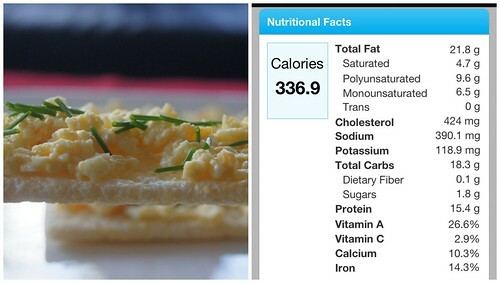 Having learnt from the day before, I decided to bump up the protein content and went with an egg and homemade mayonnaise combo, topped with fresh chives on my Cruskits. This was a fab combo and one I have already had again, as I liked it so much. That evening I had pasta for dinner and it was interesting to contrast how I felt after this meal compared to my Cruskits lunch. I certainly felt a lot thicker around the waist after my dinner! I became immersed in jobs around the house and realised I only had a very short time to make some lunch to take and eat on the way to a scheduled outing. I grabbed a tin of tuna, mixed in some feta and sun dried tomatoes for a filling for the Cruskits. As I was going to be eating in the car, I made them like sandwiches so I could easily eat them one handed. It was this day that I began to feel a noticeable difference around my waistline. My jeans felt like they were sitting better on me too. 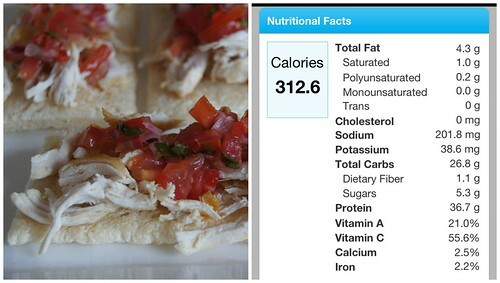 With this combo, I had the superb taste of the salsa plus the benefit of the protein in the chicken. It was delicious and it easily sustained me to my late afternoon tea at 4pm. I was completely surprised at how much I enjoyed mixing up my lunch time meals. I am such a creature of habit, I thought it would be a real struggle and I would really miss my peanut butter toast. On average over the week, my carb intake at lunch time was 72% lower than what it would have usually been. Over the week I actually lost 1.5kgs from just changing my lunch! With such positive results, this is a change I will keep in my diet. I am going to start planning my lunches and Cruskits will be a key feature. On the day before my weekly long run, I will most likely have peanut butter toast, but it will no longer be my daily staple. For someone like me, making a complete break from old habits to new habits worked well. If you too are struggling with reducing your carbs at lunch, try setting yourself the challenge of swapping your bread for Cruskits for a week and see how you go! 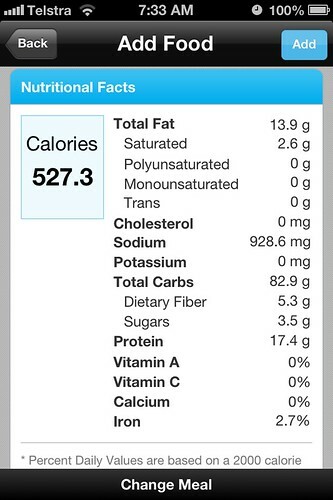 * Please note this nutritional information and other nutritional information provided in this post is indicative only. To let you stock up on Cruskits and other goodies to get you started on making a small change to the way you eat, Cruskits are giving away to one reader of Planning With Kids a $100 Coles voucher. To enter just head to the Cruskits facebook page, check out their fab toppings, then come back here to the blog and leave a comment telling me what your favourite combo to eat on Cruskits would be. 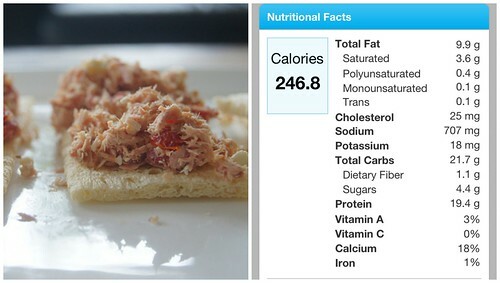 You can always upload your own photo of your Cruskits on the Cruskits facebook page to give inspiration to others who are trying for a lower carb lunch option. You may only enter once. Entries close at 5pm AEDST Thursday 11th April 2013.